A clip, spacer and disk system, adapted for attachment to a cylindrical rolling pin, which has a central axle with a handle at each end, is disclosed. The guide disk members are provided in various diameters and can be exchanged on the rolling pin to provide different thicknesses of rolled out dough, without removing the handles of the rolling pin. This is the only depth measuring rolling pin available that does not need a third part to function. Simply slip the disk over the handle and click in place. All other depth measuring rolling pins require a third piece to hold the disks on. This rolling pin can be used with or without the disks so it's the only rolling pin you need. It can be used on homemade doughs or store bought. It makes everyone a "Martha Stewart" in the kitchen. No more waste or food or time. It's perfect for the inexperienced cook or the skilled. It's so simple even children can use it. With renewed intest in cooking, TV cooking shows, the Food Newwork and great "gadget appeal" this rolling pin is a must have in every kitchen. I am seeking to either to sell the patent or liecnse with royalities. This is a utility patent good until April 5, 2024. It was sold on QVC twice a few years ago then my licensing partners ended their business and thus voided our contract and ended the sales of the rolling pin. Bed, Bath and Beyond was interested in purchasing the rolling pin but they went bankrupt before any purchase was made. Kohl's dept store was interested but wanted to purhcase from someone who has a line of products such as the Food Network, Racheal Ray, Paula Deen, etc. So as you can see there is a great deal of interest and potental. Below is a link to a youtube demonstration of the rolling pin. The rolling pin in the video was sold on QVC. The design of the rolling pin can be adjusted, such as shorter handles or a wooden roller. I would leave the length of the barrel the same as it accomodates wide doughs such as pie crusts. I have had individuals contact me to purchase the rolling pin for their own home use. People are seeking this product. 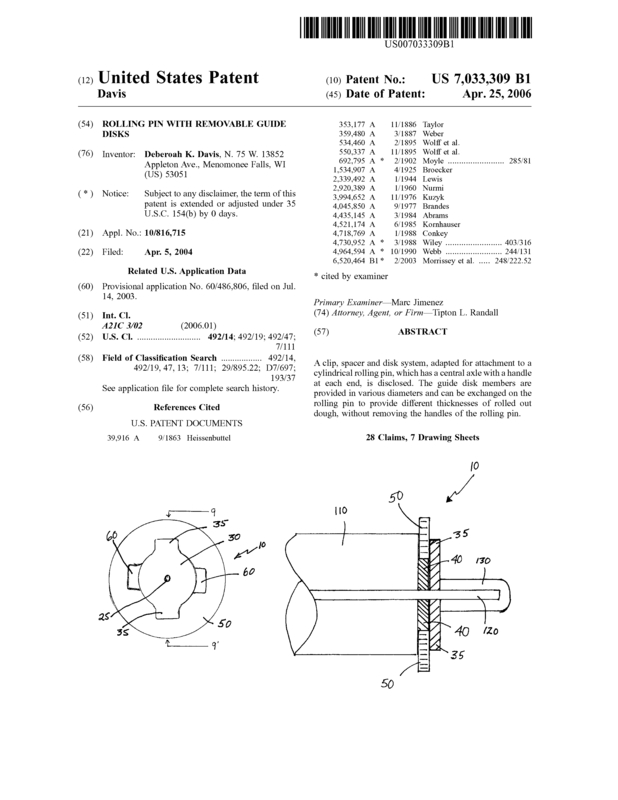 Page created at 2019-04-21 4:56:30, Patent Auction Time.